Rob Kesselring is a veteran of 31 arctic canoe expeditions, 82 BWCAW-Quetico trips and he has paddled over 150 rivers worldwide. 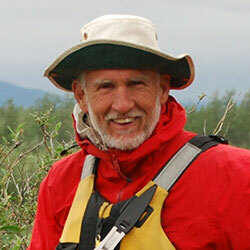 A wilderness guide in the Boundary Waters, Big Bend, and Gates of the Arctic National Parks, he is the author of three books: Merlyn Carter Bush Pilot, River Stories, and Daughter Father Canoe. Rob has spoken many times at Canoe Expos in the United States and Canada. He typically spends over 300 nights a year camping. His mantra: never half-way. Canoe camping tips and secrets gleaned from decades of wilderness river travels in Canada, Alaska, the Boundary Waters, the desert Southwest, Australia, South America, and Africa. Kesselring will pack in as much useful stuff and instructive stories and pictures as time allows. An entertaining, information-packed session from one of the most experienced canoe guides in North America.